Imperial Car Supermarkets is one of the UK’s favourite used car dealerships, with showrooms in both the north and south of England; these include our flagship stores in Northampton and Southampton. Imperial Cars covers a wide area for used car buyers from Sheffield to Torquay. We offer high quality, keenly priced used cars available to buy on fantastic in-house finance deals. Right now we have over 20 cars for sale under £6000. Click here to choose from Ford, Fiat, Hyundai, Toyota, Vauxhall, and Suzuki cars. 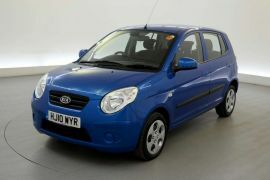 We love this bright blue Kia Picanto, which is one of featured cars this week. Fully checked over by the RAC, you can view this great car with all of it’s vehicle documents here. With low mileage, this 2010 1.1 Strike 5dr model is only £4500! It has air conditioning, a CD player, fog lights and ISOFIX seating. The perfect little family run around, you can purchase this on one of our competitively priced finance deals. Simply scroll down the car details page to find out the best repayment deal for you. You can also read about Imperial Car Supermarkets Unbeatable Car Finance here. Want to arrange a test drive? Call us on 023 8098 69852 or contact Imperial Cars here.